Hong Kong, "Asia's World City" (or so says their tourism board). One of the most densely populated areas in the world, it is a dynamic city with a strong Chinese culture tied with very modern aspirations. It is frequently compared to Singapore, as both are westernized cities that have seen rapid expansion in the business sector during the past 50 years. Promises of delicious food and stunning views were enough to convince me to visit. Our trip had three main parts - Kowloon, Macau (see part 1 and part 2), and HK Island. Here, I recap our visit to the northern part of Hong Kong, the Kowloon Peninsula. Chi Lin Nunnery and Nan Lian Garden sit as quiet refuges among the hustle and bustle of Hong Kong, nestled away in the Diamond Hill area. The nunnery serves as a Buddhist temple complex, where worshippers may pay respects to various divinities. It is connected to the garden, which is exquisitely maintained by expert groundskeepers. There are some marvelous examples of penjing or penzai, the ancient Chinese art of depicting trees in miniature. One is free to wander the grounds, which has many paths and plenty of greenery to enjoy. A few restaurants, including a vegetarian spot located beneath a man-made waterfall, are also open for visitors. There are also some Chinese timber architecture exhibits worth exploring out within the garden. It is a quick two minute walk from the MTR Diamond Hill station (exit C2). We arrived in late afternoon, and found both spots serene and quiet. One can zip through the two areas within an hour if in a hurry, but that defeats the purpose of the scenery, an abode of calm in the busy city. Hong Kong has one of the most celebrated skylines in the world, and it is not without merit. With Victoria Harbour splitting the two sides of the territory, the city showcases its prominence to great effect. Every night at 8PM, a show called the Symphony of Lights begins, so crowds begin to gather about an hour beforehand to enjoy the scenery and to grab a good seat. The light show was, in all honesty, not that spectacular. There were lasers and coordinated flashes of light, but the music could barely be heard and it was hard to follow the sequence of events. Perhaps it is better viewed from the Hong Kong Island side? Nevertheless, it was relaxing to lounge around the bay with the colorful skyscrapers dominating the view. 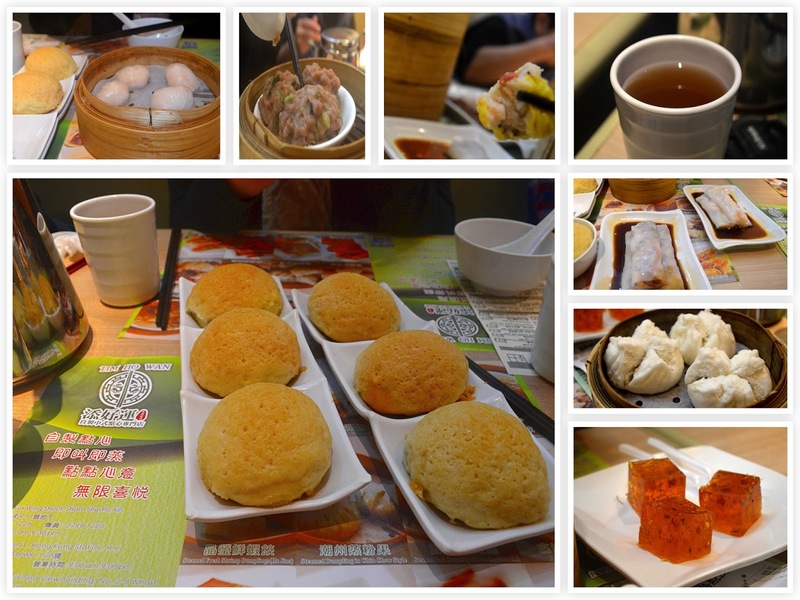 Our very first stop in Hong Kong was a trip to Tim Ho Wan. One of the most popular dim sum restaurants in Southeast Asia, it has a location that has earned a Michelin Star, ranking it among the very best worldwide. Lo and behold, that location is in Hong Kong! So we made it very high on our priority list to make it a visit. It also didn't hurt that it is also referred to as the world's most affordable Michelin Star restaurant. From bottom left, going clockwise: baked buns with BBQ pork, steamed fresh shrimp dumplings (ha jiao), steamed beef balls with bean curd skin, steamed pork dumplings with shrimp, Chinese tea, Vermicelli rolls stuffed with pig's liver, steamed pork buns, tonic medlar and petal cake. The baked buns with BBQ pork stole the show. They incorporated the pineapple-bun-style outside with an extremely savory and meaty inside. My other favorite was the tonic medlar and petal cake. Though it looks quite odd, it provided an incredibly refreshing taste after the heavy meal. Most of our order arrived at the same time, and the tables next to us oohed and ahhed as the trays were stacked high. We were the only foreigners present, and while most of the other tables were enjoying normal-sized lunch portions, we went all out. Let's just say we didn't leave Hong Kong any lighter than we arrived. Stay tuned for the Hong Kong Island recap.